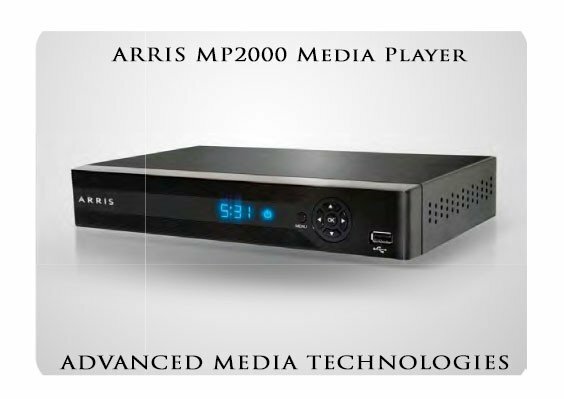 The ARRIS MP2000 Media Player supports full HD with HDMI, component and composite outputs, front and rear USB ports, 10/100 Mbps Ethernet and MoCA 1.1+. The Media Player also features front panel navigation and clock, along with a backlit remote control. The ARRIS Whole Home System is a CableCARD-ready entertainment center that’s an HD DVR, music jukebox, photo display, and game arcade wrapped in an award-winning, native-HD user interface. With the Whole Home System one-touch DVR capabilities, subscribers quickly and easily control what to record (with alerts to any schedule conflicts) and then decide how, when and where to watch it. With the six-tuner Whole Home System, record as many as six channels simultaneously while playing back a seventh recorded program. The Whole Home System delivers 75 hours of HD recording and is expandable to up to 1000 hours of HD recording via eSATA drive. The Whole Home System supports multi-room viewing via the Media Player and lets customers browse all of the recorded content on their Media Gateway, the home network, and the Internet for a truly converged entertainment experience. Whole Home System remote scheduling via browser and PDA interface enables operators to meet growing customer expectations to remotely schedule and dynamically manage scheduling conflicts of recorded programs when away from home.